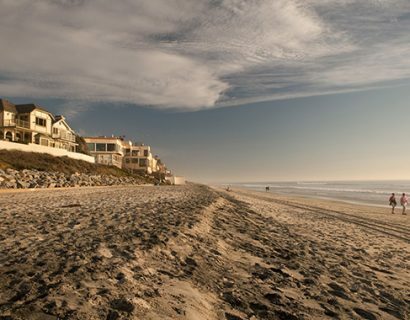 Carlsbad State Beach, also known as Tamarack Beach, stretches from the warm water jetties, just south of Tamarack Avenue, to Frazee Beach, near Carlsbad Village Drive. 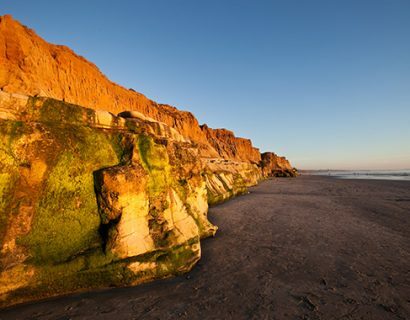 The beach is ideal for the family and kids, the state beach offers swimming, surfing, scuba diving, kayaking, windsurfing, fishing and beachcombing. 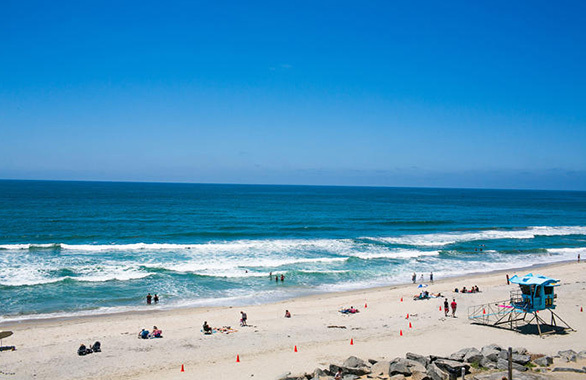 Many people fish off the Carlsbad jetties, both near Tamarack beach and the campgrounds. The Carlsbad Seawall, a paved 4-mile walking path along the coast, extends from Carlsbad Village drive to Cannon). The seawall separates The beach from Coast Hwy 101, where you can find people walking, jogging, and cycling. All throughout the day you can see joggers, walkers, cyclists and roller-bladers cruising up and down the path. This is definitely an active city. Carlsbad State Beach offers an amazing view of the sunset. Every night people gather at the north end of the beach, on the bluff (towards the village) to watch the sun sink into the Pacific Ocean. The palisades and walkway atop the Seawall is another romantic spot for watching the sunset and enjoying the ocean view. A restroom and a few rinse-off spigots are located near the parking area. If you’re feeling lucky, try the small beachside lot on the west side of Carlsbad Blvd where Tamarack Ave intersects. But don’t fight too hard to get into it. Better chances are along Carlsbad Blvd and on the surface streets near the beach. Ponto Beach, just south of the campground, has a pay lot. The beachfront closest to the parking lot is flagged for surfing only. There is more parking along Carlsbad Blvd and nearby residential streets.